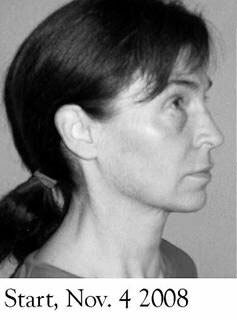 Why Another Facial Exercises Book? Raw foods made me feel 20 years young again. Now I want to look as young as I feel. I might never reach my goal, but I'll never quit trying. 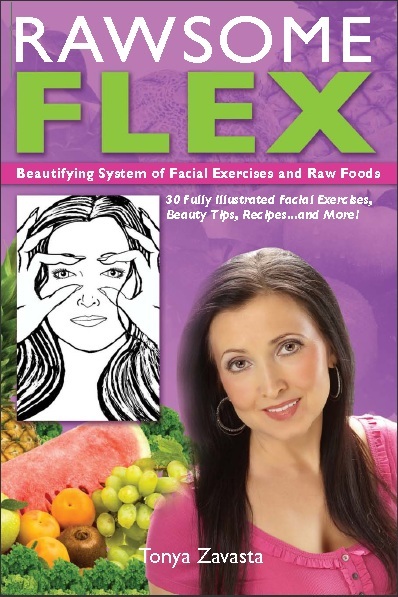 That aspiration has led me to develop my Rawsome Flex: Beautifying System of Facial Exercises and Raw Foods. I spent almost a thousand dollars to get every book that has ever been published in English and Russian on facial exercises, and I ordered every DVD available. There are some very well produced DVDs. But they lack one very important ingredient - motivation. These DVDs feature young, flawless models. They're so far from your own age and your own expectations - and mine - that it's discouraging. You keep wondering: Why are these fabulous babes doing facial exercises to begin with? Some programs I've tried or investigated are expensive, including costly hard-cover booklets to keep records, gloves for performing the exercises and Pacing CDs that I didn't need. Some are hard to follow. And others I thought were incomplete. "Before doing the Rawsome Flex exercises, I could not even stand to look at myself in the mirror. I am not exaggerating. Even though my skin looked pretty good, having been a raw eater for over 7 years, I was dismayed by my sagging jowls and drooping eyebrows. I was beginning to look my age - and I hated it! But after about 4 weeks of doing the exercises daily, I noticed that every time I would meet someone I hadn't seen in a month or more, they would remark, 'WOW, you look so GREAT!' or 'What have you been doing? You look fantastic!' I had not received such a flood of compliments since going raw 7 years ago. I am too busy in the AM to do the exercises, so I decided to do 40 minutes at night along with my yoga and trampoline routine. I just watch my Netflix shows and the time goes fast. This way I don't feel guilty about watching TV because I am multi-tasking. (I have gone through all seasons of Desperate Housewives and am now on Brothers & Sisters--I love it without the commercials!) I also do the exercises during a movie if the person next to me doesn't mind. With the "chin push ups" and "upper jaw builder" exercises, which use spoons as weight lifting props, I soon graduated from a very heavy tablespoon to 2 of them. But today I had to go out to Home Depot and get some serious weights (crown bolts for a dollar or two) because the 2 heavy spoons are too easy. I have been doing these exercises for 6 months and I swear they have wiped about 5 years off my face! Thank you, Tonya!" My Rawsome Flex System is the result of my continuing effort to ward off aging. I've determined to develop a program I can do myself - no artificial aids for me, and definitely no nips and tucks! Only when I'm absolutely delighted, utterly hooked on this method's performance did I decide to share it with you. Whatever I offer my readers, I do personally. Essentially, I developed all these exercises for myself. I increase my knowledge and experience, and pass it to you. Anything I've tried on myself and promoted for others has had to be a straightforward, simple routine; otherwise, I just wouldn't do it. The system also includes some unusual, simple, but effective beauty tips. And, naturally, some good raw food recipes. Hello, I've been a huge fan of Tonya's since I saw her speak in Point Richmond, CA last year. I've been doing facial exercises according to Rawsome Flex religiously, for over 6 months. I've seen some amazing results around my eyes (they are much more awake), and my cheekbones have drastically added muscle layers. My face looks much less hollow and I am thrilled! 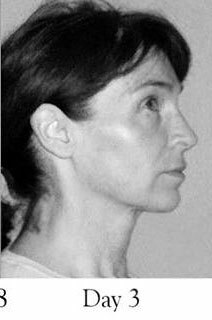 Facial exercises gave me another trump card just when I thought I had exhausted all the possibilities for a winning hand against aging, and against gravity in particular. 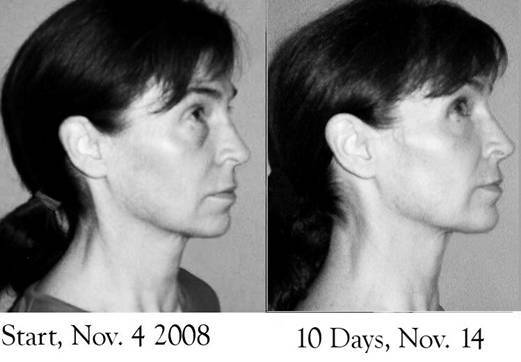 Facial exercises will narrow your face/body gap by ten years or more. If you follow a raw foods diet, facial exercises can be even more beneficial. Why stop your exercising at the neck. I'm determined to exercise my face - like the rest of my body - for the whole of my life, and I hope you will too. One of the first adjustments I had to make in practicing facial exercises arose from the fact that I wear my nails long. Therefore, any exercises that involved putting my fingers in my mouth were out of the question. I set out to overcome that obstacle and others, and to develop alternatives that would provide the same benefits but that would be more pleasant to perform. Though I do use some of the classic facial exercises that every program employs, the Rawsome Flex System is unique. In some instances, I originated my own versions of facial exercises. Every system I've tried offers some good exercises for the lower jaw, but none for the upper. I was able to fill this gap through an exercise of my own design. Tonya. More men need to understand the benefits of facial exercises. I'm 55 now and have been at it for about 15 years. My face is fuller now than when I was in my late 30's! When family or friends have mentioned I don't have that many if any wrinkles most snicker or make a joke (especially the men) when I tell them to exercise the facial muscles. Some folks will never understand that muscles grow above the neck too! I'm an entertainer and never use makeup, ever, can't stand the stuff. Filmed this about 5 months ago. You can see the buildup if you are familiar with facial muscles. Get the word out to more men! Men are just as concerned about looking younger, they just don't feel comfortable talking about it...Continued success to you. I bought your latest book Rawsome Flex few days ago and I can not be more happy with the information in it! Thank you SO much for another great well researched book that is a product of your love and your passion for beauty. I believe in what you do, Tonya and in your total and complete devotion to health and beauty. I have every product that you offer on your website and will keep following your quest for rawsome beauty. I believe some of the exercises I've originated are the most effective. Some of your facial muscles will actually lift weights, using simple props available in every household. I spent many weeks refining each exercise for the best possible effect. If I was unable to improve an exercise, I combined it with others to make it more effective while saving time. As I tried every exercise offered by others, I sought to create better effects with fewer repetitions. Each exercise, you'll find, becomes a workout on its own. In fact, in my program you do each of 30 exercises once during the first week and then twice. We begin with one area - eyes for example - do about 3 to 5 different exercises in this particular area, each building on the effect of the previous set. Then we move to another area. It's much easier to remember your schedule because it works specific areas at a time. The exercises I refined or designed “from scratch” are easy and fun to do. Any exercise done incorrectly will cause problems, and facial exercise is no exception. But correctly done, these exercises will lessen the worn out appearance of the face and return some of its youthful fullness. Fortunately, the exercises in the Rawsome Flex System are almost impossible to do incorrectly. In Rawsome Flex, there are 30 exercises with illustrations and detailed instructions. I’ve also included new beauty tips and inspirational information intended to make you do the exercises. At the end of my 21-day regimen, you will have developed a healthy habit that will be hard to break. Kelli, my research assistant, tried out my program for 6 weeks, and provided the Before and After pictures below, as well as her comments. Kelli: "Okay. I had no idea there was such a difference until I put the pictures side by side! All I did differently was braid my hair and put on a little eye makeup. Really. I think I look like I got a face lift or something. Still lots of room for improvement, but it's well underway. Goodbye, nasty jowls! 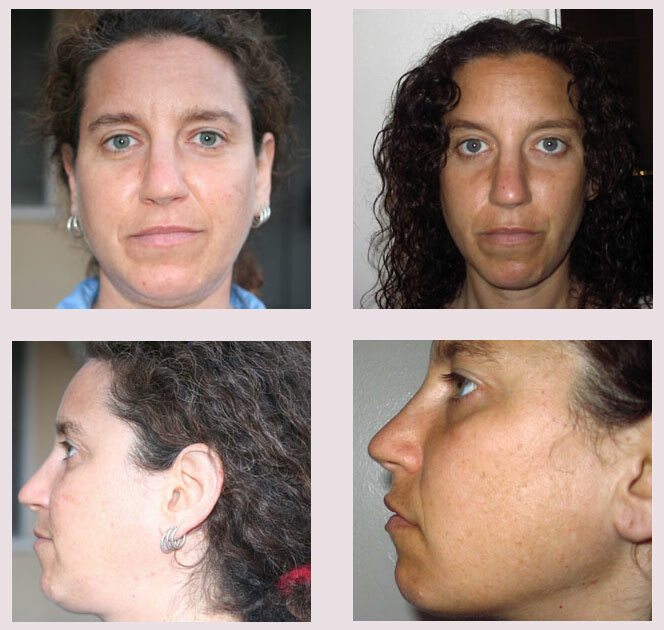 Did you get to read 6- week journal of facial exercises? I hope you enjoy it and that you can post it on the site asi believe it will influence others to use your program. Here (below) are before and after picture. The "After" photos were taken at approximately 6 weeks.To be honest with you, i am not thrilled at the close ups of me, but i do see a vast improvement from the "Before" photos (I should have worn make-up, but felt i wanted it to be as natural as possible to really show the difference). Just bought your products and love them! 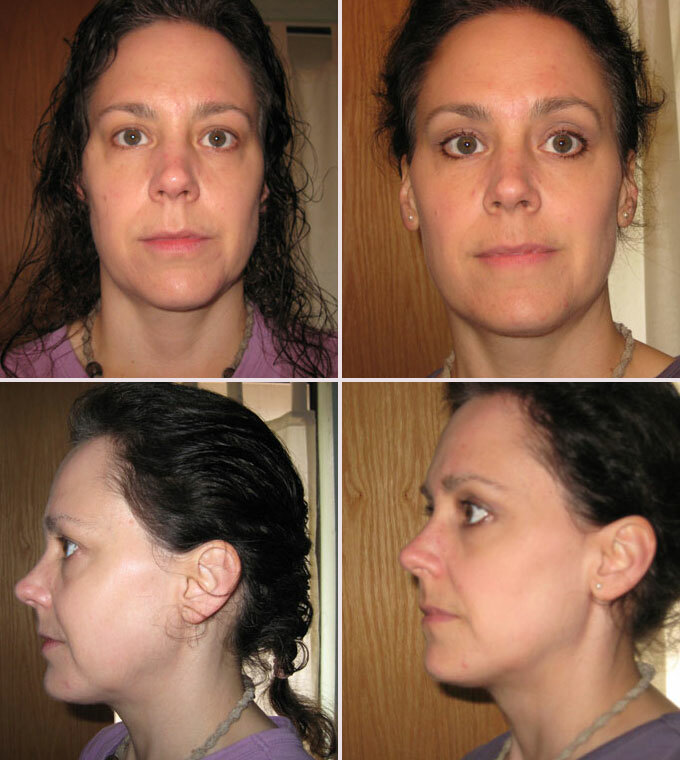 I have also been doing your facial exercises for only three days and want to send you the results so far…this is amazing! I am 55 yrs old and am almost totally raw (about 90 percent at this time). What’s so noticeable are the opening of the eyes and the lifting of the mouth chin area. Wow! I’m sold! Pat here. I wanted to thank you for the book, and also send you the 10 day comparison. My skin is looking brighter too, since I have been using your facial mask and cream and brushing, brushing, brushing! I am on Day 9 and wanted to mention that before starting these exercises, I was losing hair at an alarming rate, when I combed my hair when I got out of the shower you could knit a sweater, there was so much left in the comb. I believe it is the hair pulling exercise which helps, I do it quite a lot throughout the day and now there is very little in my comb! The color in my skin is also much better and I am brave enough to go out without foundation and blush, a real breakthrough.